A keen skateboarder and champion BMX rider since his youth, Gavin Pardoe was working as a fire station watch officer when he received an Aspire Award for community engagement with young people. 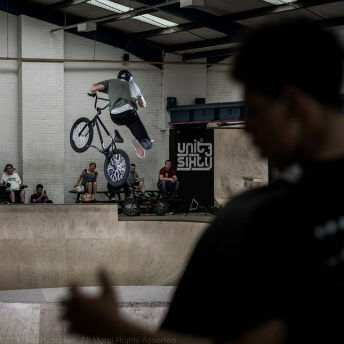 Bringing these two interests together, Gavin had the idea of opening an indoor skate park in Stourbridge for children and young people, offering a safe space for them to meet and enjoy skateboarding, BMX and scooter riding. Gavin set about finding suitable premises and, with his wife Serena, established Unit3Sixty as a Community Interest Company (CIC). They secured support from Dudley Metropolitan Borough Council and funding from a variety of sources. The result is a state of the art 22,000 square foot facility with CAD designed track that can be altered to vary the experience for riders or even fully transported elsewhere. As often happens in business, an unforeseen event threatened to derail the enterprise. Gavin explains: “The ramp builder left the site three quarters of the way through the job, because he realised he had misquoted and couldn’t complete for the price we had agreed.” This left Gavin and Serena looking for additional funding, to complete the work and get the park open. “We have raised just over £250k in total,” says Gavin, “from a variety of sources, including ART Business Loans. ART was recommended to us by another funder. Martin came out to visit us and immediately grasped the potential. Of all our funders, ART has been the most in touch with what we want to achieve and understood that as a social enterprise, it is the impact of what we do on young people’s lives that is critical, it’s not just about the figures.” The loan from ART helped to create jobs and build a street plaza section of the track. Although principally set up for local children and young people, Unit3Sixty has become one of the leading venues in the UK it is being used as one of the tracks for the British Championships. It now attracts visitors from far afield and has become a destination track for many participants.